Be sure to check out the Sauder Heritage Hill collection for more great items! Add a touch of traditional beauty to your home with this library with doors from the Heritage Hill collection. If features three adjustable shelves to store and display books, collectibles, home décor and more! It also includes cord access through the enclosed back panel. 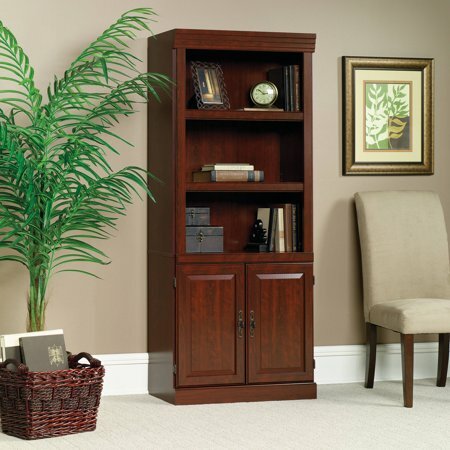 Finished in Classic Cherry, this handsome library makes a great addition to your home or office. We had searched everywhere for a bookcase that could hold all of our books for our new home. We ended up buying two of these and couldnt be any happier. They do take a little time to assemble but well worth it! They look great and are great quality! Would definitely buy more if we needed them! I've had these for a year now. They look great. I had them apart, but recently moved them next to each other. They look like one solid unit. Hold all my items nicely. The finish is a dark, reddish brown. You can also store things on top of these. While it took over an hour to put together, the instructions were very good and the piece looked great. We love it! Love this bookcase. Easy to put together. The bookshelves are darker than pictured, but are very nice when put together. The assembly is easy but it takes about 3 hours with two people. Not bad though. Great product. Well made. Perfect match to my desk. Looks great and very useful. Blends in very nicely with the mahogany furniture which I inherited. It took about 5 hours to assemble, but I was very pleased with the final result. I did make some minor adjustments after assembly to eliminate some small gaps where pieces fit together. Instructions failed to mention that the top and bottom of backing should be selected so prepunched nail holes would match with the fixed shelf. One nice feature is that clips are provided to attach two bookcases together if you wish to place them side by side. Be very careful about sliding these units since no glides are provided for the bottom of the bookcase. Nice looking and sturdy shelf. Since we already owned two of these shelves I knew what we were getting. The only difference this time was that fewer of the pieces were marked. This meant taking a few extra minutes to make sure I was grabbing the right piece. The instructions are adequate, but not great. However, anyone with common sense can work them out. The shelf is very beautiful.